The Moore family consisted of parents Josiah B. (aged 43), Sarah (née Montgomery) (39), and their four children: Herman Montgomery (11), Mary Katherine (10), Arthur Boyd (7), and Paul Vernon (5). An affluent family, the Moores were well-known and well-liked in their community. On June 9, 1912, [Mary]?Katherine Moore invited Ina Mae (8) and Lena Gertrude Stillinger (12) to spend the night at the Moore residence. That evening, the visiting girls and the Moore family attended the Presbyterian church where they participated in the Children's Day Program, which Sarah Moore had coordinated. After the program ended at 9:30 p.m., the Moores and the Stillinger sisters walked to the Moores' house, arriving between 9:45 and 10 p.m.
At 7 a.m. the next day, Mary Peckham, the Moores' neighbor, became concerned after she noticed that the Moore family had not come out to do their morning chores. Peckham knocked on the Moores' door. When nobody answered, she tried to open the door and discovered that it was locked. Peckham let the Moores' chickens out and called Ross Moore, Josiah Moore's brother. Like Peckham, Moore received no response when he knocked on the door and shouted. He unlocked the front door with his copy of the house key. While Peckham stood on the porch, Moore went into the parlor and opened the guest bedroom door, where he found Ina and Lena Stillinger's bodies on the bed. Moore immediately told Peckham to call Hank Horton, Villisca's primary peace officer, who arrived shortly thereafter. 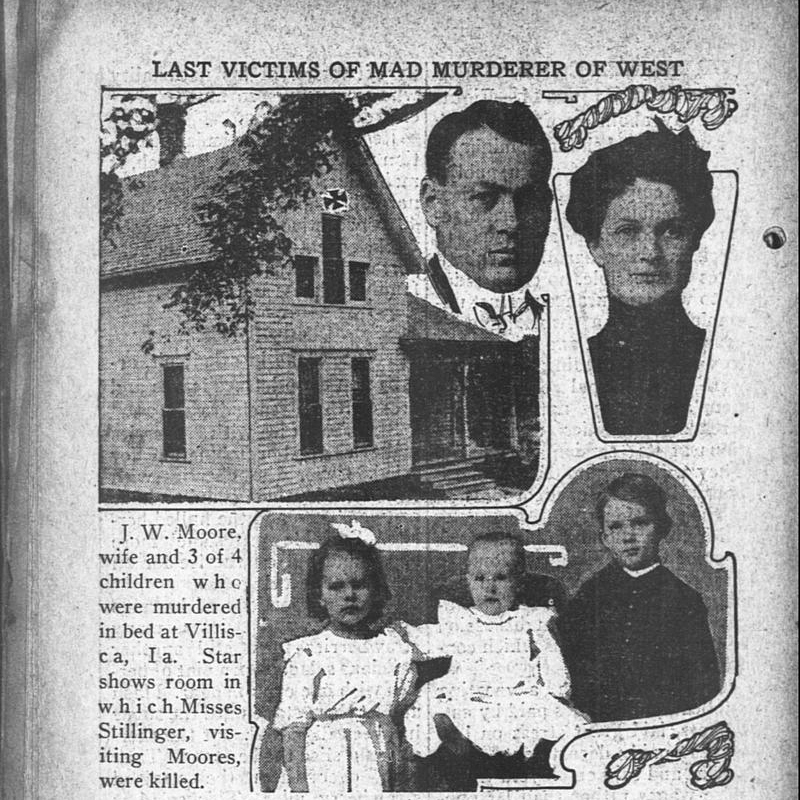 Horton's search of the house revealed that the entire Moore family and the two Stillinger girls had been bludgeoned to death. The murder weapon, an axe belonging to Josiah, was found in the guest room where the Stillinger sisters were found. Doctors concluded that the murders had taken place between midnight and 5 a.m. Two spent cigarettes in the attic suggested that the killer or killers patiently waited in the attic until the Moore family and the Stillinger guests were asleep. The killer(s) began in the master bedroom, where Josiah and Sarah Moore were sleeping. Josiah received more blows from the axe than any other victim; his face had been cut so much that his eyes were missing. The killer(s) used the blade of the axe on Josiah while using the blunt end on the rest of the victims. Then the killer(s) went into the children's rooms and bludgeoned Herman, Katherine, Boyd, and Paul in the head in the same manner as their parents. The killer(s) returned to the master bedroom to inflict more blows on the elder Moores, knocking over a shoe that had filled with blood. Afterward, the killer(s) moved downstairs to the guest bedroom and killed Ina and Lena. Investigators believed that all of the victims except for Lena Stillinger had been asleep when murdered. They thought that she was awake and tried to fight back, as she was found lying crosswise on the bed, and with a defensive wound on her arm. The first trial ended in a hung jury and the second in an acquittal. The crime remains unsolved. The news report from the day after the murders. UNPLEASANT FACT: Serial killer Dennis Rader would sometimes spend time in his victim's houses, hiding in their closets until they were at their most vulnerable. In Hessdalen, Norway, strange lights of white and yellow have mysteriously appeared in the sky since 1940. These lights used to appear 20 times per week between 1981 and 1984. Since then, the frequency of the spectacle has drastically reduced to 10- 20 times per year. There have been theories presented about the lights, but no compelling hypothesis on its origins has ever been accepted to explain why or how it appears to this day. I've suffered from insomnia as far back as I can remember. I was in second grade and it was really early in the morning, I think around 5 or so. I had a little TV on my nightstand and was definitely watching LOTR on vhs. I had the volume up super loud because my ceiling fan always made a ruckus throughout the night. I was super in to the movie when all of the sudden all of the sound around me started to slowly fade away. I remember I became confused and reached to turn my TV up thinking it had broken, but then I realized the sound of the fan had faded with it. The only way I can describe it is comparing it to someone turning the volume down on a car radio. I was suddenly overwhelmed by an intense feeling of euphoria. I have never experienced anything like it. I absolutely cannot describe how utterly at peace I felt. I was able to comprehend what was happening, and then it clicked in my head that I was dying. Keep in mind that I'm in second grade so this is a pretty intense conclusion, but I just knew. I rolled over onto my back ready to, and excited to except my fate. That was when I saw it. There was a large white figure in my doorway, just hovering, and pulsating a white aura. I quickly panicked, and began calling out for my brother (his room was across the hall). The figure glided to the end of my bed and just sat there, watching. I'm not really sure how much time passed, but the figure suddenly vanished, sound came back, and the euphoria disappeared. I jumped out of bed and ran into my brothers room where I practically flew into his bed. He woke up and when he saw how panicked I was he began to panic as well. I was hysterical and just kept telling him it was a ghost. We did what any other kids would do and his under the covers. After a while we got anxious, and I bravely made a peep hole I'm the blanket to check the time on the clock, hoping that it would be daylight soon. 5:30, the clock read 5:30 in the morning. Then the phone rang, and it rang, and rang, and rang. Me and my brother started to panic even more, then silence. Once again it began to ring, and ring, and ring. We jumped out of bed and took turns running from light switch to light switch until we had a lite path to the living room (our house was 5,000+ square foot, this was not an easy task). We got to the living room and watched cartoons until my mom woke up. She was livid, yelling at us for being up so early. I told her I saw a ghost, which only made her more upset. My brother, who was always tormenting my irrational fears, got mad at her and started telling her this wasn't a joke and it wasn't my imagination. I starting telling her to check the phone, because I saw the ghost around 5:30 and it must have been the ghost calling (kid logic). She went to check the phone and went to the other room for a while, suddenly she wasn't upset anymore. When we asked if it was said ghost she said it was a telemarketer. She was so nice about it she let me sleep I'm her room the next few days. I thought maybe since it was my brothers birthday that day that she just didn't want to argue, but she never let me sleep in her room. I got home from school one on the 15th, I saw the ghost in the early hours on the 13th. My mom called me to the family room and told me to sit in her lap and that she needed to tell me something, I obliged. My great grandma passed away in the hospital at 5:30 a.m. and the phone calls were my grandma calling to notify us. Me and great grandma were extremely close. To this day I get chills thinking about it. I know that there are a few ways to explain the occurrence, but I know for a fact that it was 100% a paranormal experience. My m and brother still back me up on it today.